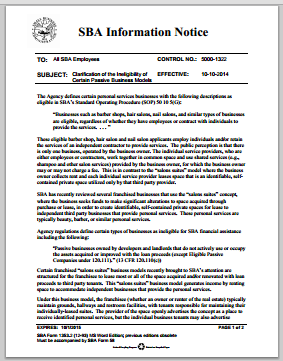 SBA has clarified certain passive business models that are inegilible. Certain franchised “salons suites” business models recently brought to SBA’s attention are structured for the franchisee to lease most or all of the space acquired and/or renovated with loan proceeds to third party tenants. This “salons suites” business model generates income by renting space to accommodate independent businesses that provide the personal services.